Hip and Handmade in Indy is our retail program promoting locally-made, handcrafted goods. 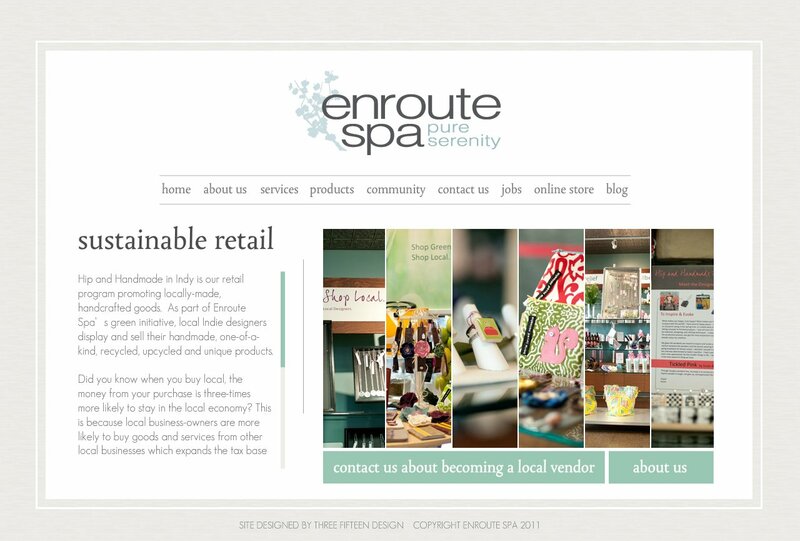 As part of Enroute Spa’s green initiative, local Indie designers display and sell their handmade, one-of-a-kind, recycled, upcycled and unique products. Did you know when you buy local, the money from your purchase is three-times more likely to stay in the local economy? This is because local business-owners are more likely to buy goods and services from other local businesses which expands the tax base and supports the local economy. When we take care of our own, we are investing in our own community. When you buy handmade, you support the notion of producers of culture instead of consumers of culture. Your purchase through Hip and Handmade in Indy helps cultivate small, local business. All of our partner artists are wonderful people who live here in Indiana and continue to give back to the community through their art and energy. They are extremely kind, loving and talented people.